I finished another card for one of my daughter's teachers and thought oh dear Halloween is tomorrow...better get it posted. Soooo this will be a quick little post hopefully you enjoy it even if it provides inspiration for one of your cards next year. This adorable little image is from Whimsy a Sylvia Zet image called Batty Boo. I still think Hazel is my favourite but I do love these little bats. I had originally thought this was going to be for one of Emilee's male teachers but at the last minute she changed her mind and it's going to a female teacher. Good for me because I got to rethink the design just a tiny bit and add some Gumdrops and ribbon...and you all know how I love those things. Happy Halloween & thanks for stoppin' by! This isn't an image I would normally choose to colour but I thought this gal was pretty. This is Soho from Whimsy a Kenny K image. Love that hair! I paired the image with Retro Bottle Cap stamps & die also from Whimsy. Groove Dude for a Groovy Dude!! Well I am way ahead of the game this year! My amazing husband's birthday isn't until March 5th & for the first time ever I already have his card done!!!! Woooo hooo! This is Groove Dude from Whimsy a Kenny K image & I just think he is sooo cool!! Have a wonderful day & thanks for stoppin' by! Here comes the Cool Kid!! 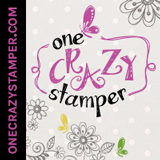 Today I have Cool Kid by Kenny K (from Whimsy Stamps). I am on a little mission this year to create more masculine themed cards which I always seem to struggle with. The image on this card is cut out an instead of using foam dimensionals to pop him up I used a Wobble. So he has some action going on which I thought perfectly suited the fact that he seems to be movin' to the groove with his Ipod. The sentiments are computer generated and punched out with a scallop punch. I have coloured with Copic's and done some shading with Prisma pencils. Hope you enjoy today's post, have a wonderful day & thanks for stopping by! Well this is not the post I had ready for you today but we are going with it. My son turns 23 on Tuesday, Jan. 8th....lucky kid was born on Elvis Presley's birthday...made my Mom a very happy lady since she is an Elvis fanatic. I thought it would be a good idea to get this card up sooner rather than later. Oh in my eyes the Cheers Dude (Kenny K image from Whimsy) guy is holding a glass of Root Beer, which for fun I will give my son a can taped to his present LOL! I know a lot of us find guys cards a challenge...me included. This paper is actually from Bo Bunny's Detour Collection & I thought the colours were just perfect so I coloured the image to match the papers. There is no Prisma shading on this one, it's all Copic. The sentiment is also from Whimsy and it's called Retro Bottle Caps. The froth on the top of the Root Beer is Liquid Applique. I typically let my Liquid Applique dry for 24 hours before I puff it up with my heat tool but since I was in a rush to get this one done I went for it. If you leave it to dry you get a much smoother puff. Sharing a little Christmas Dreaming with you today. This is a Whimsy image by Crissy Armstrong. I am sold out of this image in the store at the moment but this post is for the gals who have purchased this stamp and would like to see what to do with it. I have used totally untraditional Christmas colours for this one...I do love blues with browns. This is a 6 x 6 Easel card made using the Labels One Grand Calibur dies. Today I have a card I originally prepped for a class a while back & I thought I would share this sweetie with you today. This is Kaydance from Whimsy, you can find the image here!